We left Pisang early in the morning after a breakfast of hot oatmeal and mint tea, and headed to Manang. 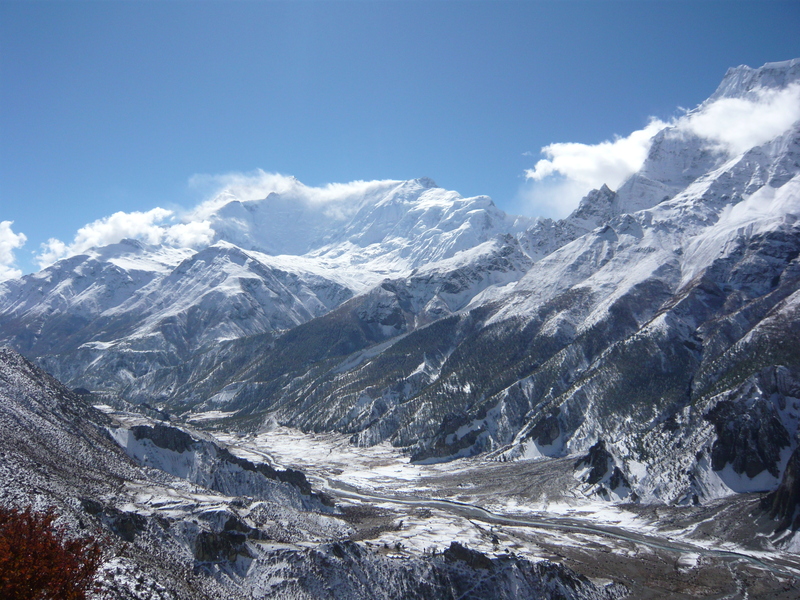 There are two routes to Manang: The short (4 hours tops) and the long (7-8 hours). We chose the long one (after much pressure on my dad who would rather have done the easy one) which took us up above the valleys climbing into the clouds. It was our first and only “bad” weather day and to our chagrin, it snowed. Being from Minnesota, I of course am accustomed to snow and cold weather, however, we were mainly disappointed about the lack of view. The gorgeous mountain views were blocked behind the snow clouds and occasionally we would see the white tip of the mountain poking out of the clouds. It was a disappointment since the main reason we took the extended hike was for the marvelous views but we felt blessed to have had so many amazingly, spectacular days. Our hike was remote and lonely stopping briefly in a small village where we had hot apple pie and mint tea. We finished our long day in Manang, a special place that is one of the largest, most wealthy villages in rural Nepal and is known for the bakeries. Although we were eight days walking from the end of the road, we still at last were able to feel somewhat connected to civilization by the appearance of internet cafes. The service was spotty, but still! 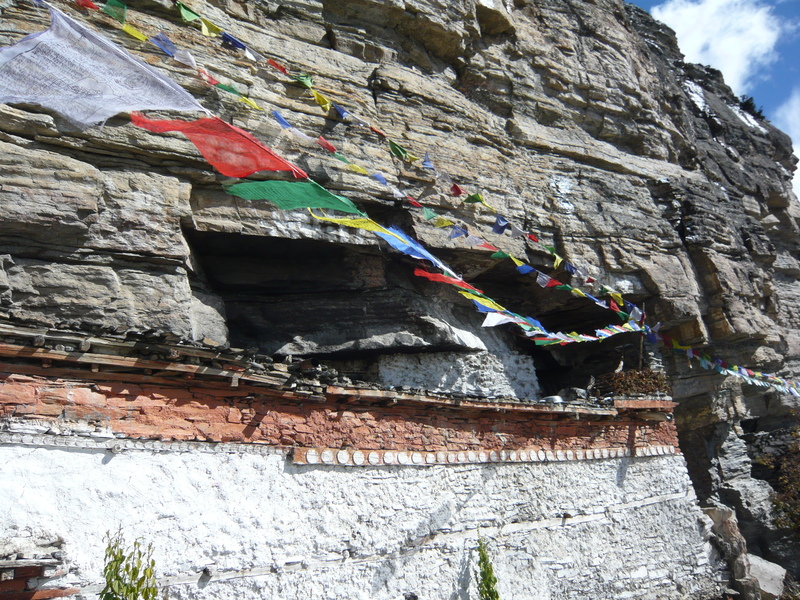 Probably one of the coolest cultural experiences of the entire trip was our visit to the Manang monastery. 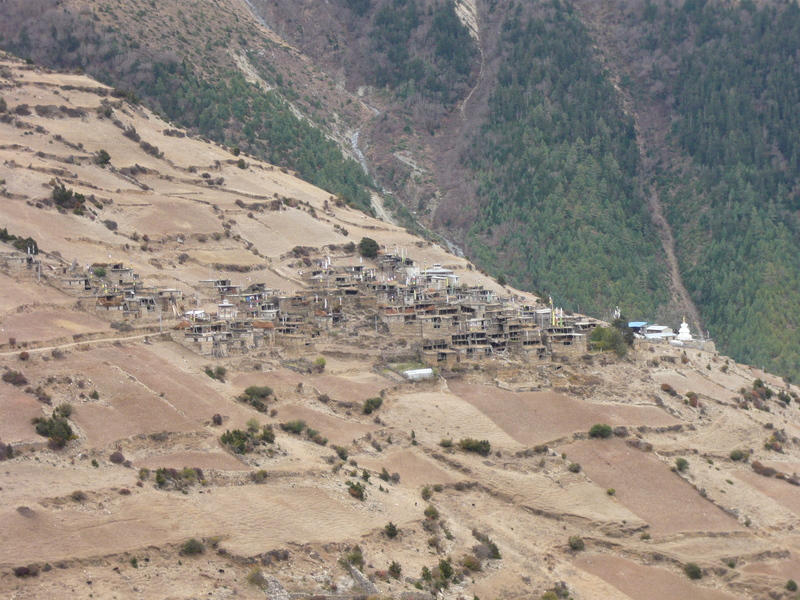 Due to Manang’s high altitude (11,483 feet), most trekking groups stop there for a day or two of acclimatization. 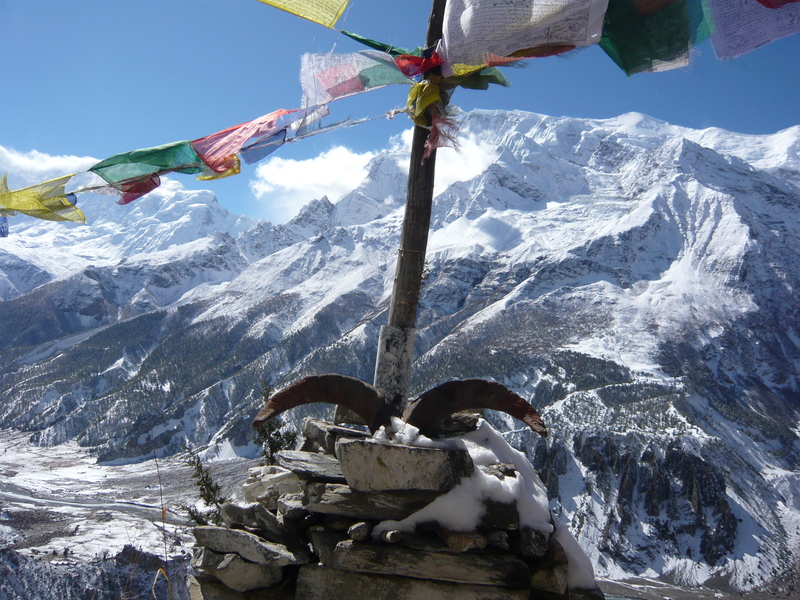 An excellent acclimatization hike is to the famous Manang monastery, about another hour and a half straight up the mountain above Manang. There, lives the magical, 95-year-old Monk and his daughter (who is 65) in a cave monastery. The highlight of the chest-pounding, barely-able-to-breathe hike up is to be blessed by the monk. Upon entering the cave, you wait in line and when it is your turn, you receive a personal blessing from the Monk. He places a string necklace around your neck (or else for $7 you can upgrade to a beaded necklace), says some Buddhist prayers and well wishes (which of course you don’t understand) and then you leave to see the most magnificent, spiritual view of the entire trek to date: The incredible, mighty Himalayas in all their glory. It is truly an amazing experience and I did not take those beads off until I landed safely at home in the States a week or so later. Wow! 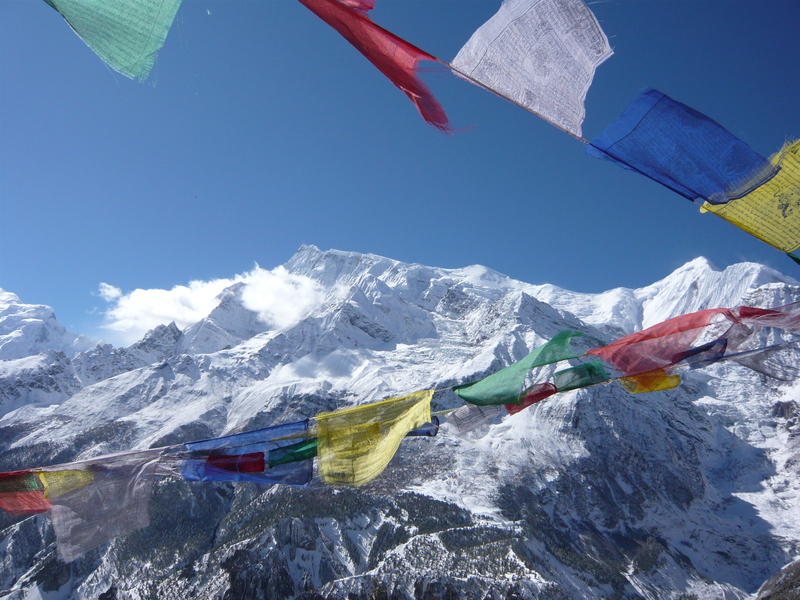 Your photos of the Himalayas are spectacular! Thank you! If only the pictures could capture the true beauty! We were so fortunate to have such fantastic weather.